2: Do you have any siblings? 3: Do you watch anime subbed or dubbed? 4: How old are you? 5: What is your favorite sport? 7: What is your favorite tv show? 8: Do you marathon shows or watch a few episodes at a time? 9: How often do you exercise? 10: Do you wear makeup? How often? 12: Would you rather watch a movie or a tv show? 13: Do you have your driver’s license? 14: What is your favorite animal? 15: Black widow or Catwoman? 17: What is your earliest memory? 19: What is your biggest pet peeve? 21: What is the worst injury you have ever had? 22: What piercings do you have/want? 23: Any tattoos? if not, would you get any? 25: What is your best subject in school? 26: What is your favorite book series? 27: Do you have a crush on anyone currently? 28: Single or in a relationship? 29: What character would you most like to cosplay? 30: Are you an introvert or an extrovert? 32: What is the most embarassing thing to ever happen to you? 33: Tell me a story. 34: What is the strangest thing you’ve ever seen someone wear? 35: Where in the world would you most like to travel? 40: Have you ever left your home country/state? 41: Do you prefer to travel by car or airplane? 42: Are you a fan of rollercoasters? 43: What is your favorite OTP? 44: Who is your favorite Disney princess? 45: Who is your favorite Disney prince? 46: Who is your favorite Disney villain? 47: Do you sing along to the radio? 48: Who is your favorite Harry Potter character? 50: If you could have one of the Deathly Hallows (cloak of invisibility, Elder Wand, or Resurrection Stone), which would it be? 51: What house would you be in Hogwarts? 52: When was the last time you told someone you loved them? 53: Do you have any weird habits? 54: What do you do when you’re bored? 55: What is the strangest thing you’ve seen at Walmart? 56: What color are your eyes? 57: What is your natural hair color? 58: Have you ever broken a bone? How? 59: What is your favorite food? 60: What do you look for in a relationship? 61: If you could live in any era, which would it be and why? 62: How late do you usually stay up? 63: What is your favorite website? 64: Have you been to any concerts? 65: Are you involved in any extracurriculars at school? 66: If you could be the opposite gender for a day, what would you do? 67: What are you most proud of? 68: Do you have any big regrets? 69: What was the best day of your life? 70: Do you crack your knuckles? 71: Do you play any instruments? 73: Do you like hot or cold weather? 74: What is your favorite song of all time? 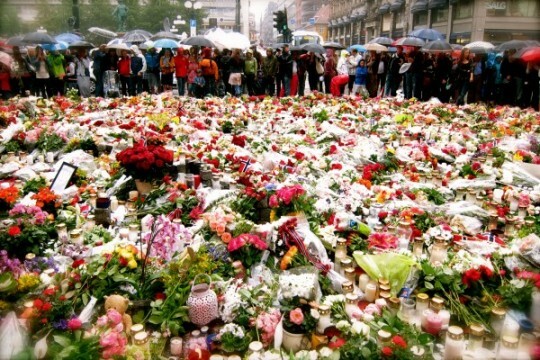 Today it is 5 years since the worst attacks on Norwegian soil since the second world war. A right-wing terrorist placed a bomb near government buildings and killed 8 people. Right after he went to Utøya, an island where a political youth camp held place, where he killed 69 people and injured even more. 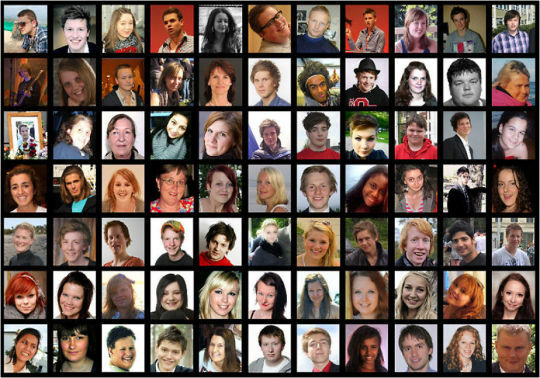 Here are are all 77 victims. 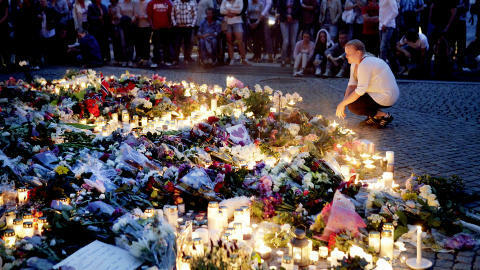 In the days following the attacks, the song “Mitt lille land” covered by Maria Mena became popular and has later become a song that represents this time of shock and horror that the people of Norway felt. 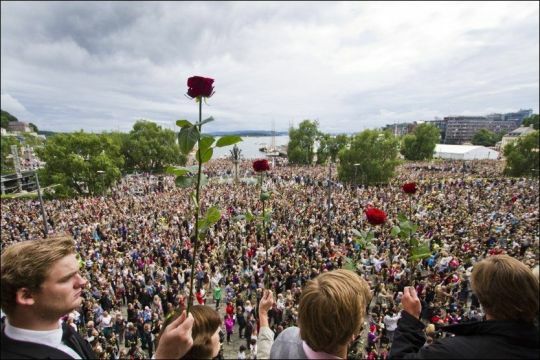 All over Norway, people gathered in memory of the lives lost in “rosetog” (rose marches) where thousands of people put down roses and lights in honour of the victims. 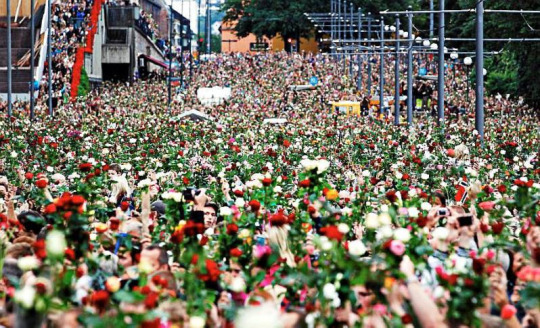 The biggest rose march was on July 25th in Oslo, where as many as 200.000 people gathered. Norway is a small country and it was said that as many as 1 in 5 Norwegians were directly or indirectly affected by this tragedy.